This attractive round, Tropical Board Walk 100 all steel receptacle is well suited to mall, park or boardwalk areas where attractive design, corrosion resistance and large capacity are desired. The outer body of punched sheet steel is strong, smooth and can be either zinc plated with a powder coated polyester , or hot dip galvanised with two pack epoxy finish (Marine Grade). 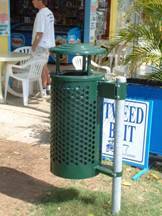 The plastic or steel liner holds 80 litres of litter. With Ibis proof lid. See brochure for variations. 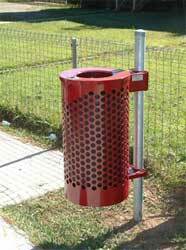 The Bus Stop Bin is a compact snag-free designed bin which encourages public tidiness at congregation points, but at the same time has minimal impact on pedestrian flow. Constructed from zinc plated 2mm steel it features a self emptying ashtray, stainless male lock & 52 litre metal liner. It is secured with 6 x 10mm vandal resistant, quick release screw bolts to the mounting post which can be 50mm or 65mm nominal bore tube (specify your choice). Standard finish is powder coated, also available in two pack enamel. The Bus Stop Bin utilizes our standard square key (order separately) wall mounting bracket available as an optional extra. 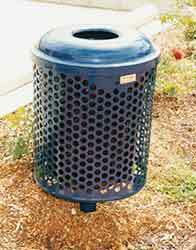 This pillar mounted tidy bin is constructed from 1mm thick zinc coated sheet steel. Internal liner and clearance through a rear opening, key lockable door. Capacity is 50 litres, with the access hatch designed specifically to deter dumping of household waste. 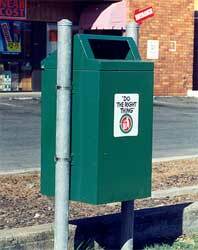 The PM50S bin is side-mounted to a post or wall using screw clamps , strapping systems, or direct bolt-on through the bin sidewall. There is also a pedestal available to permit a free standing application. 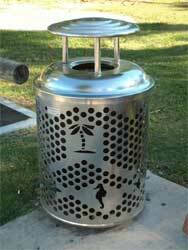 Ruggedly constructed, the bin conceals its contents from public view and is vermin and vandal resistant, thereby providing this attractive item with a long service life. Supplied ready to install. The PM50D model is of an extra strong construction with an entrance flap to deter pilfering by birds and feral animals.